You are here: Home / Professional Development / How will You wield the word NO this week? The word NO is a powerful word. With mostly negative connotations. Yet saying NO can be positive, as well. The outcomes of our behaviors and actions are influenced by the words we use to support how we serve colleagues and clients. How many times during each day do we use the word NO? How is this word unconsciously, perhaps unintentionally, not only creating barriers for profitable collaboration? Also, how is this word impeding remarkable customer experiences and employee experiences? Do you get in your own way with the word NO, before you even start each workday? What other “NO” statements do you start your day off with, intentionally or not? Can you begin a sentence with the word “Also” or “Yes,” instead of starting with the word NO? In our conversations with clients and colleagues, often the word NO is the first word spoken. Before we present our own ideas. Even if we are in agreement with the ideas being set forth by others. How aware are we of how our own speech habits impact how we set the client and employee experience table for the conversation that follows? Consider how many times you start off sentences with the word NO. Then listen for how many times clients and colleagues do the same. Are you serving as a Naysayer when you wield the word NO? We all know who the naysayers are in our own organizations and our clients’. Naysayers show up, seemingly out of nowhere, when there are decisions to be stalled or derailed. Over time, teams become intimidated by naysayers. As a result, we do not give these individuals collaborative opportunities to be part of creating remarkable and enduring client outcomes. From the start of the initiative. Over time, naysayers are marginalized and they eagerly return the favor. How might we change our behaviors to turn their NO into a Yes? Then, think about the stories we will tell. Then again, the word NO Thank You can liberate us from what is holding us back from moving forward, as Professionals of Worth. We hesitate to say NO to any opportunities offered us. Because we are fearful that the one opportunity we say NO to will be THE opportunity we should pursue. 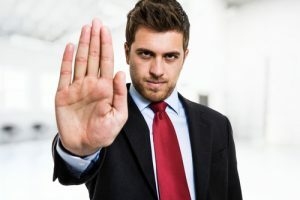 Consider that our inability to say NO is a solid reason that we are so overly committed to endeavors which do not positively contribute to our professional development. Consider how saying NO Thank You, and then communicating what you might say YES to, facilitates the best use of your time and skills in better serving colleagues and customers. This week, observe how many times we wield the word NO in our daily routines. What scenarios would you add to the ones I talk about? Click here and share with me! ©2019 One Millimeter Mindset™ / Sales Aerobics for Engineers®, Ann Arbor MI. I appreciate it when you share the link to this post on social streams. However, to re-post or republish the content of this post, email babette@salesaerobicsforengineers.com for permission and guidelines. I thank you for respecting intellectual capital.